At this year’s aircraft Interiors Expo in Hamburg Bucher was honored to show several of its leading product innovations. One example was Bucher’s high-end bar unit that combined with an ergonomically designed B/C Front Row Monument provides optimal weight savings and ideal space utilization in the cabin. Another new product on display was the elegantly designed F/C Tray Table “Cannes”. This exciting addition to the Bucher product line features a fully-automated deployment system and most importantly does not require the use of electrical motors. Bucher was excited to show these and other products to the many visitors, customers, and partners who attended the Expo. Also at the Expo, Airbus once again named Bucher “best in class Galley & Monument supplier” for our excellent customer service performance in 2014. Bucher already won this award in 2009, 2010, 2011 and 2013. 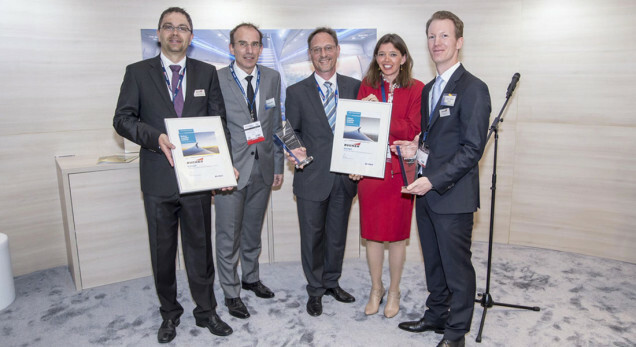 Also for the 5th time Bucher won the award for being one of the Top 3 BFE cabin suppliers in the same category by Airbus. Both of these awards underscore the success of Bucher’s customer-centric focus and commitment. Prev:Experience Innovation, Quality & Reliability. Experience Leichtbau.